Amazon Exclusive: Mi A2 Third Flash sale to start on Aug 30: Amazon is in for surprising its customers yet again with amazing deals and offers. In its latest offer, Xiaomi Mi A2 was available exclusively on Amazon India and mi.com. The Mi A2 which was launched on August 08, 2018 was up for sale for the second time on the e-commerce site on August 23, 2018, the first time it was available on August 16, 2018. 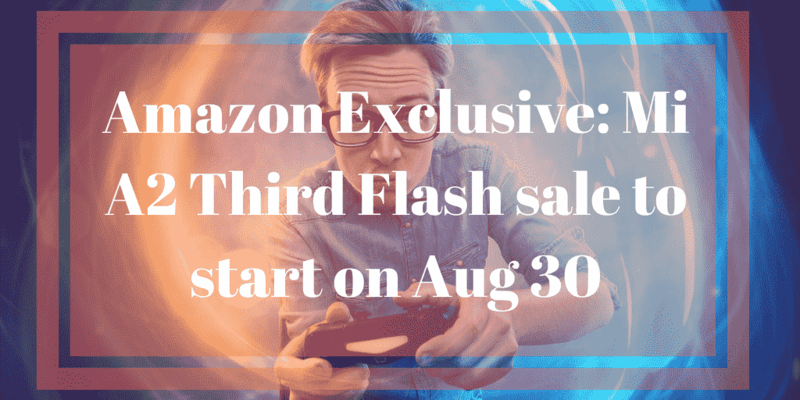 The next Flash Sale for the smartphone will be held on August 30. Consumers have the opportunity to buy the Xiaomi Mi A2 from Amazon exclusively on August 30. The sale will start at 12 pm and will be limited for 15 minutes. The smartphone up for sale will be available with 6GB RAM variant and a storage capacity of 64GB. It will be offered at an amazing price of Rs 16,999 in two color variants of black and gold. Consumers can avail the offer by visiting the official website of Amazon India and mi.com on the day of sale. Apart from this, as per reports from Xiaomi, the smartphone company will be soon launching a new top-end model with 6 GB RAM and storage capacity of 128 GB. However, the exact date of launch is yet to be announced. Well, not only are the consumers offered the brand new Mi A2 smartphone at a reasonable price but there are also more in store for consumers to gauge on. In addition, Xiaomi is offering a couple of offers to buyers on the purchase of Xiaomi Mi A2. On the purchase of the phone from the sale, buyers will receive a cashback offer of Rs 2,200 provided by Reliance Jio. Customers will be given the cashback offer in the form of 44 cashback vouchers in the value of Rs 50 each. Individuals can redeem this amount using the My Jio app for recharging their Jio account on the Xiaomi Mi A2 smartphones. Not only this, buyers will also receive an addition of 4.5 TB data. This can be availed by the buyers only when they recharge with a prepaid plan of Rs 198 or above on their Mi A2 phone. If this wasn’t enough, users will also be getting a free subscription of up to three months on Hungama Music app. Amongst all other features, Xiaomi stands out for its software, which is also the highlight of the smartphone. Being part of the Android One program, the smartphone device runs on Android 8.1 Oreo out-of-the-box. Furthermore, it is slated for an update of its software to Android 9 soon. The specifications of the smartphone include a 5.99-inch wide display screen with an FHD+ resolution making the images and visuals all the more clear and elegant. The screen aspect ratio is 18:9. It comprises of Qualcomm Snapdragon chipset of 660 octa-core, which is fitted under the hood. Apart from all the amazing features that make Xiaomi a great buy and the different storage options laid for one to choose from, the phone, unfortunately, doesn’t come with slots for inserting microSD for expansion of memory. Xiaomi Mi A2 comes with a dual camera facility offered to click superb HD quality pictures anywhere, anytime. The phone consists of a combination of 12 megapixel and 20-megapixel sensors to click amazing pictures and take superb clarity videos. In addition, it also comprises of a 20-megapixel snapper on the front side accompanied by a soft LED flashlight useful in dark and night. Additional features of Xiaomi Mi A2 consist of a 3000mAh battery along with a Quick charge 4.0+ support. This can be used with the USB Type-C port for charging the smartphone quickly without causing damage to the phone. The smartphone also takes care of your security, ensuring all your data are safe and doesn’t fall in wrong hands or theft. For this, it is offered with a fingerprint sensor at the back of the phone. Connectivity options include slots for Dual-SIM cards, Wi-Fi, IR Blaster, 4G VoLTE Support, Bluetooth and much more. Although it doesn’t comprise of a 3.5mm audio jack, Xiaomi comes with a 3.5mm to Type-C adapter making the experience all more exciting. So, what are you waiting for? Grab the deal before it runs out of stock. Bring home the Xiaomi Mi A2 smartphone and avail for other exciting offers which come handy on its purchase. Visit the official website of Amazon India or Mi.com and gift yourself a new phone. Offer will be valid only for August 30, 2018. Get Set and Buy before the product runs Out-of-Stock!